I've been consumed this past two weeks with a task. That task was to assist my FIL with his move from Enid, OK to Williamsburg, VA. I spent a week in Enid helping my FIL sort through his house that was full of a life time accumulation of belongings. My FIL is a retired General and has traveled the globe during his career. His home was stuffed full of many beautiful treasures. My task was to help him sort through all of it determining what he wanted to keep. We also divided up many things to be passed on to my husband and his sisters. My beautiful MIL passed about 1.5 years ago and now it was time for Dad to move closer to his family here on the east coast. Many of those beautiful treasures came to my house to be passed on to our family. My MIL had champagne taste and she collected many beautiful things. She was quite the collector too. To my great surprise and delight, this is one of the treasures passed on to me. I nearly passed out on the floor when I opened up this box! 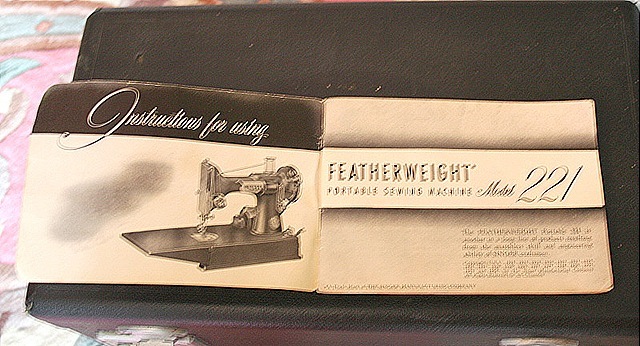 A Singer Featherweight 221 in the original case with all the manuals and accessories. This machine is in immaculate condition too. This machine has been passed down through her family and I don't have all the history on it yet, but I will treasure this for a long time. Oh, I can’t wait to hear your adventures on the Featherweight! I’m so intrigued by them. What fun! Isn’t it great! So shiny and immaculate. I bet you can’t help looking at it. And can’t wait to use it. If only it could speak. Hi Suzy, thanks for your sweet comment about me and my dear old friend – she is the funniest gal and we have such a great time when we get together. I’m thinking of a trip home and staying with her perhaps next year – it will be one long laugh I know! That was a difficult project you undertook to assist your FIL, but how grateful he must be. I hope his move to VA goes well and that he’ll be happy once settled near you. As for the Singer, wow! how great to own one of these little beauties – I know you will enjoy it. Your garden looks lovely – great perennial border. Plant Delights is awesome but so expensive – I’ve had to stop going!! That is lovely, and how nice to have such a wonderful reminder of a life well lived. 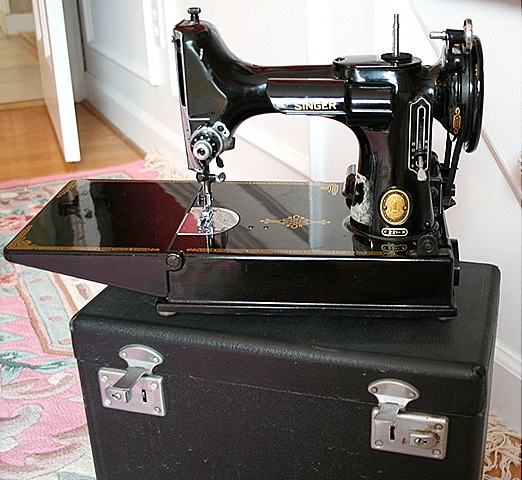 What a wonderful sewing machine! It looks like it is brand new. It must have been hard for your FIL to sort through all of the things collected over the years. I know he was comforted that you were there to help. Wowza, that is soooo awesome, Suzy! What a wonderful gift for you! You must be so touched. I know you’ll enjoy it! Oh Suzy, my jaw positively dropped when I saw that! I wanted a feather weight for many years. And finally I put one on layaway and got it a few years ago. But yours is truly in the very best condition; I can tell. You LUCKY, LUCKY girl! It is a perfect memento, given to the most perfect person. I know how much you loved your mother in law, and I am touched that you have that wonderful memory of her for your sewing studio. Your new old Featherweight looks brand new. It’s gorgeous. Lucky girl! Hi Suzy, I’ve just been reading all about your newly acquired treasures and thinking how fabulous all these treasures are and what fun it is for you to decide where you’ll put them all! It’s always hard for people to down-size but your FIL surely is happy to have some of his collections going to your wonderful home! Of course, the sewing machine is just too too amazing! Enjoy!!! 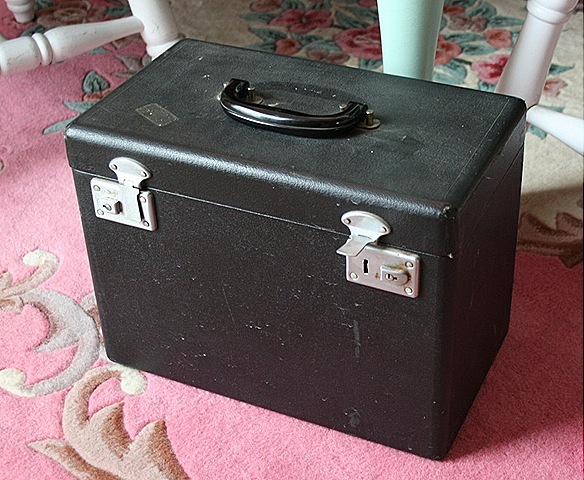 My MIL has the same machine and she’s used it to sew OODLES of things for decades.